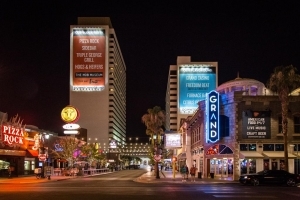 The Downtown Grand, located at 206 N 3rd Street, Las Vegas, NV 89101 opened on November 12, 2013. It has easy access to I-15 and I-515. The hotelÂ’s design provides convenient gateway to the Downtown3rd. Downtown3rd includes a number of attractions, including Downtown3rd Farmers Market, Mob Bar, Triple George, and Pizza Rock. The site of the Downtown Grand was renovated from the previous Lady Luck casino property. It has one eighteen-story tower and one twenty-five story tower. A walkway across Third Street links the two towers. Downtown Grand has 634 contemporary designed hotel rooms. Rooms have marble baths. The casino has 25,000 square feet of space. PICNIC is located on the hotelÂ’s rooftop. It offers a restaurant, bar, and a large pool. The pool bar is designed for a new type of experience. PICNIC will have spaces with live grass. The venue offers gaming action and complete entertainment. It has exclusive seating areas separated with translucent material designs. The rooftop bar & poolÂ’s picnic theme will provide a sense of reminiscence of a time past. The Spread is a deli restaurant located inside The Downtown Grand near the casinoÂ’s full-service race and sports book. The Spread serves classic deli fare including sandwiches with artisan quality meats, breads, toppings, and ingredients. Many selections are offered such as soups and salads in addition to pasta salads, potato salad, wraps, and some deep fried foods. Stewart + Ogden is located inside the Downtown Grand. American style food is served. The restaurant is open for breakfast, lunch, and dinner. For breakfast, some more elaborate variations of American style fare is offered in addition to classic breakfast dining. Eggs, omelettes, pancakes, waffles, and side dishes are served. Other choices include cereal, fruit, and bagels. Lunch at Stewart + Ogden includes breakfast entrees such as made-to-order eggs with toast, steak & eggs, waffles, and other popular options. There are burgers, including one named after the restaurant, and different types of sandwiches. Lobster, strip loin, or pork sandwiches are served. Main dishes offer a choice from a variety of American classic entrees on the order of fish & chips, chicken strips, NY strip steak, and pot roast. Dinner choices present American favorites including a five-cheese, house special macaroni; roast chicken and chicken pie; different types of burgers named after the restaurant; filet mignon; rib eye steak; New York strip; and post roast. A soft pasta with a meat sauce made with greens and Italian cheese is offered. Salmon, trout, shrimp cocktail, as well as calamari are available choices. Spaghetti and a pasta fresh vegetable dish can be ordered, along with other items that are available at lunch as well. The Art Bar sits inside the Downtown Grand Hotel, not far from the lobby. Paintings from artists in the Las Vegas area are displayed on the ceiling. Art styles of some pictures might be described as painterly or abstract. There is a creative variety of food selections offered, in addition to original cocktails named after well-known artists and related themes. Other beverage choices include premium red & white wines; domestic, commercial & craft beers; imports; as well as champagne. Triple George Grill, a steak house, is available for lunch and dinner. Red Mansion provides a Chinese food dining option. ADDRESS 206 N. 3rd St.